There was a lot of buzz around the CAMS Australian Rally Championship’s last visit to Western Australia and by the end of the weekend, that anticipation was justified. The first round in Victoria had lived up to so much and with two new world-class rally cars entering the fold with Eli Evans and Adrian Coppin, the stage was set for an exciting round. Once the action got underway, it was round one winner Harry Bates who drew first blood, finishing one second ahead of Contel Communication’s Steve Glenney and Evans. It was the same story in the second stage but Evans had closed in to only one tenth of second behind Glenney and a further seven tenths behind Bates’ gap. The three drivers were a cut above the rest with Molly Taylor the next best performer. After two stages of finding his feet in the new Skoda Fabia R5, Evans flicked the switch and won the heat’s remaining eight stages – and with Bates going down on the sixth stage, the three-horse race became a two horse race, which Evans controlled thanks to a two-minute lead. 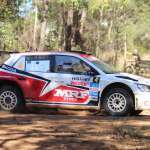 Glenney led the Subaru charge as Glen Raymond, Molly Taylor and Brad Markovic rounded out the top three with the latter more than five minutes behind the leader. Incredibly Lewis Bates and local boy John O’Dowd were having the battle of the day as only one tenth of a second separated the pair by the end of the day, Lewis Bates going into the second heat leading. On the second day of action, Bates was back with had a point to prove and he started strong, taking out the first stage of the day, but it didn’t last long as Evans bounced back to pick up the next three stage wins and put the round to bed. A consolation win to Bates in the fifth stage of the day only motivated Evans more as the Victorian eventually took out the remaining four stages of the weekend. Evans finished the day with a 45 second lead over Bates and more than a minute ahead of the round’s runner-up in Glenney who comfortably sealed second place. The battle for third outright between Taylor and Raymond continued right through the second heat as Taylor finished well ahead of her Victorian counterpart. The only difference come the end of the round was Coppin finding his feet in the Skoda after limping out in the first heat. In the second heat, the Queenslander replaced Raymond in the top five and the result hended Taylor her first podium for the year. With Raymond’s consistency rewarded with a fourth place outright, Bates snuck into the top five at the expense of his brother who finished equal sixth with Brad Markovic, while O’Dowd finished behind the two and ahead of Coppin who finished ninth. Rounding out the top 10 was another Queenslander Ross Dunkerton.